What’s your favorite holiday cookie? Mine just so happens to be Chocolate Macadamia Nut Cookies. I’ve been making these for years and my family and friends love them, too. When I joined up with some blogger friends for the Baking NOW tour, I knew immediately that Chocolate Macadamia Nut Cookies would be the recipe I would share with all of you. It’s perfect for cookie exchanges, a day of baking with the kids, parties and homemade holiday gifts. Santa would love a couple of these cookies when he stops by your house. Cream the butter, brown sugar and vanilla. Add the egg and beat until combined. Add the flour mixture and mix well. Stir in the pecans, macadamia nuts and chocolate chips. 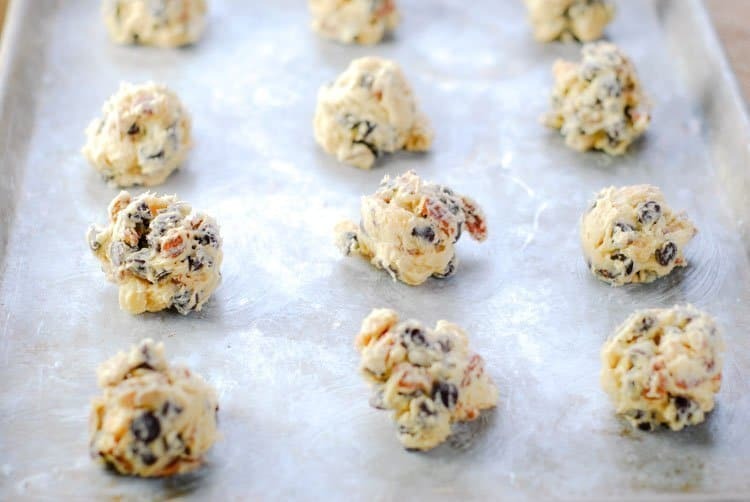 Drop by teaspoon fulls onto greased baking sheets and bake at 350º for 10-12 minutes. Cool completely on wire rack before drizzling with caramel glaze. 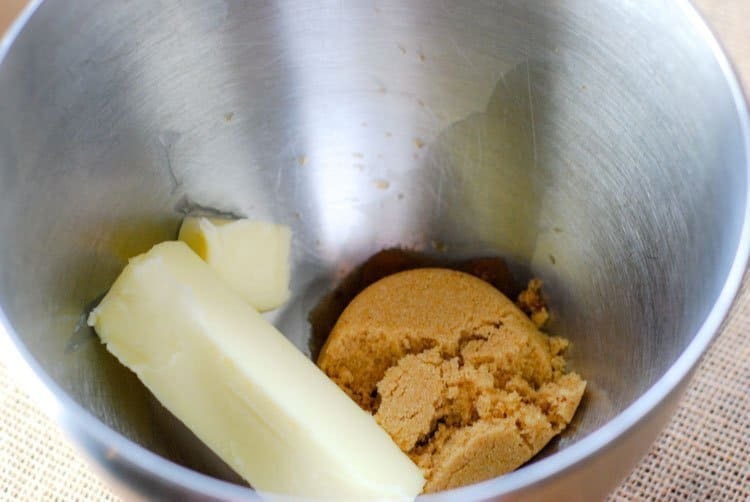 In mixing bowl, cream butter, sugar and vanilla. Add egg. Combine flour, baking powder, baking soda and salt. Add to creamed mixture and mix well. Drop by teaspoonfuls onto greased cookie sheets (2 inches apart). Bake at 350º for 10-12 minutes or until golden. For glaze: Melt caramels and cream in a saucepan over low heat, stirring until smooth. Drizzle over cooled cookies. I hope you’ll join us each Tuesday from now until Christmas for the Baking NOW holiday tour. From now until November 20th, we’ll be giving an Ebelskiver package away as part of the Baking NOW tour. 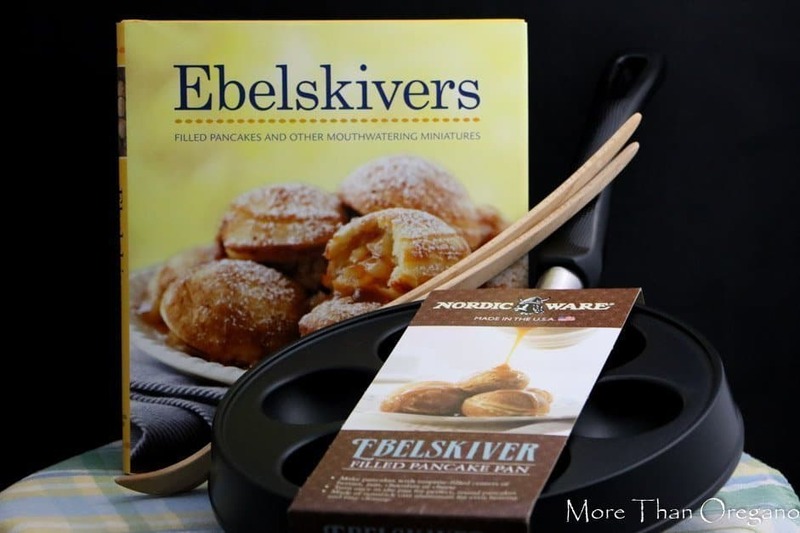 If you’d like to enter the Nordic Ware giveaway AND learn to make Ebelskivers, click here! I do hope you try my Chocolate Macadamia Nut Cookies and visit all the other participating blogs. 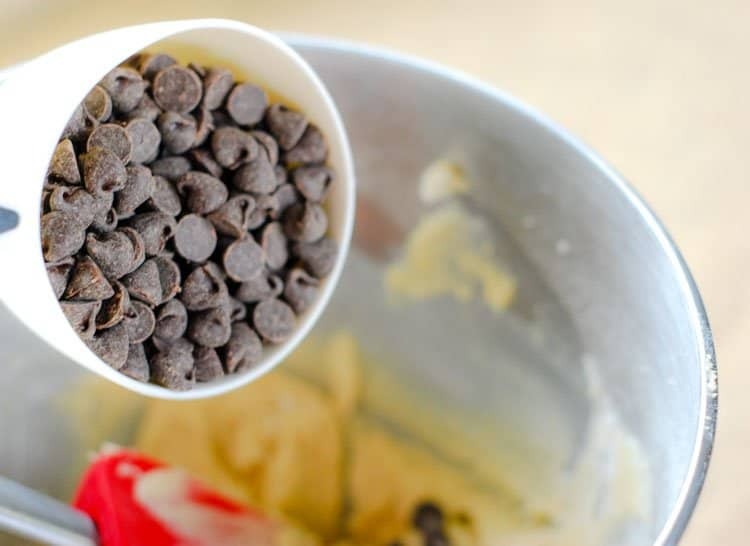 Do you have a favorite holiday baking tradition? I don’t think there are two better words in the English language than ‘caramel glaze’! Looks like a fabulous recipe! Chocolate macadamia sounds delicious, they are favorites for me too. Whoops, I replied before I finished commenting, anyway I want to try your recipe. I haven’t made them myself. Baking yummy treats with my family is definitely a favorte holiday tradition! These cookies sound divine! I love chocolate and macadamia nuts! Gotta try these! I love how you added caramel – I bet it’s the crowning touch! I would love to make these during our holiday baking sessions. My mom makes about twenty different kids of cookies at Christmas and I look forward to it every year. The only things I make are Ricotta cookies and fudge. I really like pumpkin cookies with chocolate chips. I like most cookie flavors, and I love holiday desserts 🙂 I think having home-made goods just makes it a more memorable time with family and loved ones. Thank you for the recipe. I love chocolate chip cookies, though never had chocolate macadamia nut cookies I think I would munch them down pretty fast. Thanks for the recipe. 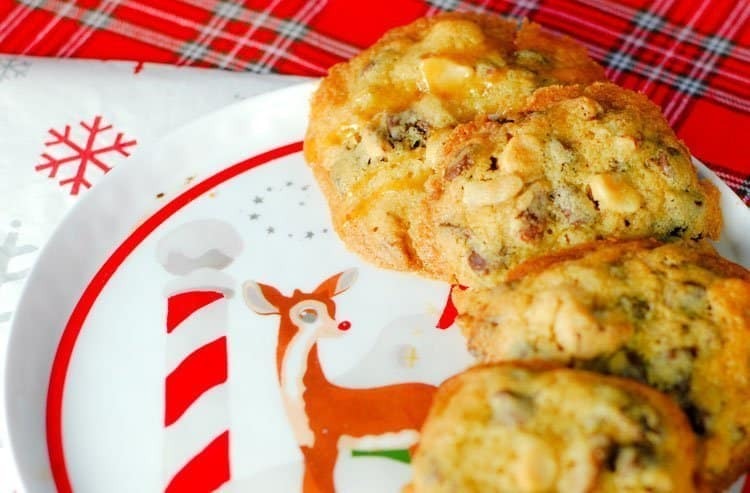 These chocolate macadamia nut cookies look and sound like perfect Christmas cookies. I love how the caramel is drizzled over the top. Yummy!!! Thanks for sharing the recipe. Chocolate Macadamia Nut Cookies are my absolute favorite. I will be giving this recipe a try soon! Oh Gosh! My husband will love me after making these–he will probably love you too! LOL! You know what I mean! He has a sweet tooth, and I know he will love these! Thank you for the recipe! These look really good. I’m use to have the white chocolate macadamia nut cookies but these look even better. Adding this to my cookie baking list. I love choco macadamia combination. It’s a mix of sweet and a bit of nutiness in the macadamia. dawn recently posted…FORD SCHEDULED TO LAUNCH NEW TECHNOLOGY-PACKED 2017 ESCAPE! These look like some delicious cookies! My husband loves macadamia nut cookies. Chocolate and macadamia nuts are SO great together! I like making them with white chocolate. I love chocolate macadamia cookies!! I don’t eat dairy nor gluten so I would have to alter the recipe bit (it never turns out the same!). 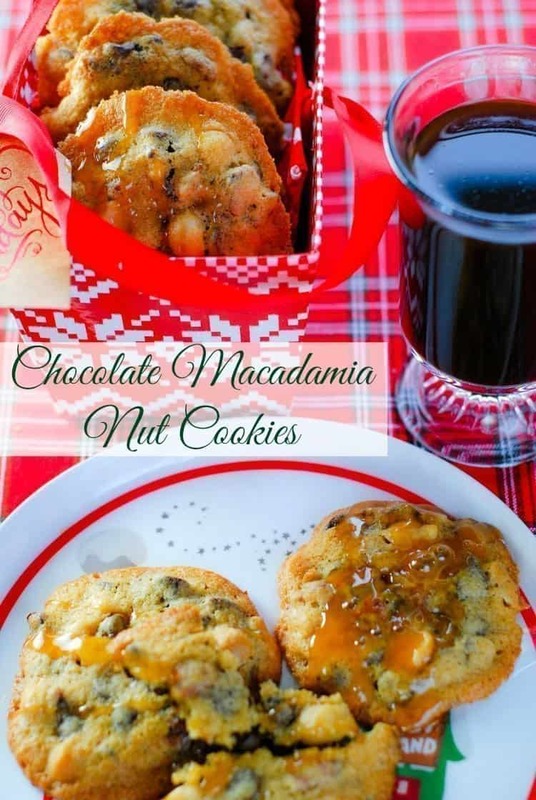 I love love love macadamia nuts, they are a favorite of mine so I will have to try this recipe out as chocolates and nuts are two of my favorite things.